BROOKLYN, NY -- (MARKET WIRE) -- April 2, 2007 -- Aladdin Beverage (PINKSHEETS: ADTJ), Importer and distributor of fine beer and ale throughout the United States, has been named the exclusive US importer for Antares Beer, Argentina's fastest-growing premium beer from New Patagonia Brewery, www.antaresbeer.com. The exclusive and unique Antares Beer is a distinct alternative to other premium beers, offering a genuine difference in taste and quality. 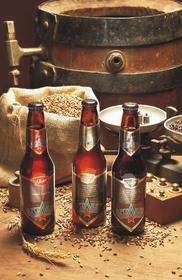 Specially brewed to be extra smooth and less grassy, Antares is a refreshing, full flavored, super premium lager. Brewed at the New Patagonia Brewery in the southernmost region of Latin America, at Mar del Plata, Argentina, "quality and tradition" is the steadfast motto of this family owned brewery. This commitment to quality and excellence has allowed the brewery to become the most exclusive and unique independent brewery in the Southern Cone. The exclusive and selected beer portfolio includes: Kolsch Beer, Scotch Ale Beer, Porter Beer, Imperial Stout beer, and Barley Wine Beer. Antares is available both is 330ml and 600 ml amber glass bottles, including six pack for 330ml references. Antares is already popular as an export beer is several other countries. Outside of Argentina, Antares is currently sold in Canada, Germany, Australia, South Africa, Brazil, and Japan (coming soon). Juan Manuel Balmaceda, Director of New Patagonia SA, is enthusiastic about entering in the American market: "We know that Americans are becoming more and more choosy and sophisticated about premium beers. Antares is among the best in the entire world, and it will be the only beer from Patagonia in Aladdin's list of world-class beers." Headquartered in New York City, Aladdin Trading is a leading fine craft beer and ale importer serving the North American markets. It is Aladdin's goal to be known as the top beer importer to North America, with only quality and forward-thinking brands in its portfolio. Our mission is to generate sustained growth for all the brands in our portfolio and generate maximum return on investments. For more information, visit the company's web site at www.aladdin-trading.com. Forward-looking statements in this report are made pursuant to the 'safe harbor' provisions of the Private Securities Litigation Reform Act of 1995. We wish to advise readers that actual results may differ substantially from such forward-looking statements. Forward-looking statements involve risks and uncertainties that could cause actual results to differ materially from those expressed in or implied by the statements, including, but not limited to, the following: our ability to meet our cash and working capital needs, our ability to successfully market our product, and other risks detailed in our periodic report filings with the Securities and Exchange Commission.